Act similarly as microRNA in Ago complexes. Inhibit protein synthesis by displacing eIF4G translation initiation factor. Suppress proliferation and modulate DNA damage response in a miRNA fashion. Destabilize oncogenic mRNAs by competitive binding to YBX1. Prevent apoptosis by complex with Cyt-C.
Promote stress granule assembly to help cell survival. Sensitize oxidative-stress-induced p53 activation and neuron cell death. Mediate epigenetic inheritance of diet-induced metabolic disorder. Associate with diseases such as cancers, infections, and neurodegenerative diseases. The disease association and the abundance in biofluids and the cells make tRFs/tiRNAs attractive for biomarker applications [2-4]. Arraystar tRF & tiRNA sequencing service focuses on tRF/tiRNA profiling, together with miRNA profiling specialized and optimized for the workflow. 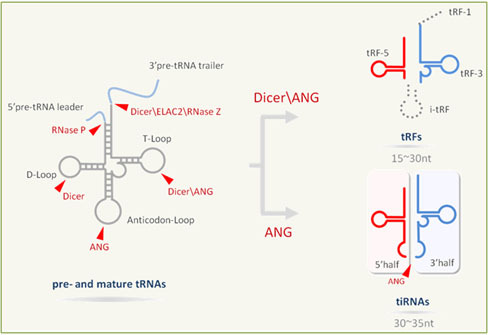 The dedicated analyses and annotation are equipped for tRF/tiRNA structure and biology. The vertical comparison with microRNAs and horizontal comparison with tRFs/tiRNAs in the databases provide rich integral information for functional search and biomarker screening. • ncRNA PCR Panels New! • mRNA PCR Panels New! • Real-Time qPCR Reagents and KitsNew! • Seq-Star™ NGS Solutions New! • tRFs&tiRNA Sequencing Service New! • tRNA Sequencing Service New! • nrStar™ PCR Array Service New! • LC-MS tRNA Modification Analysis Service New!